One of the things that I love most about Europe is it's multitude of historical buildings, of which most are still very much in use today. 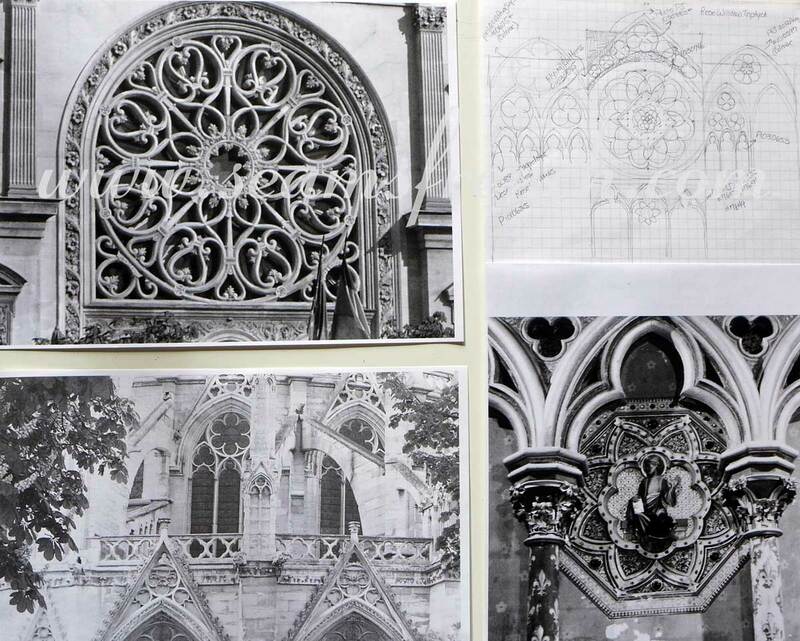 Cathedrals, in particular, provide a huge source of design inspiration for me. From floor to ceiling, inside to out, they hold a treasure trove of motifs and patterns. So consequently, a large portion of my photographs are of churches and cathedrals. 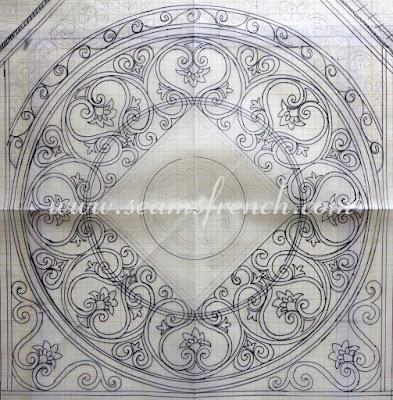 Rose windows, in particular, fascinate me and seem to have become a recurring theme when I'm designing my boutis. One of the reasons is that the patterns in these windows easily lend themselves to boutis design. 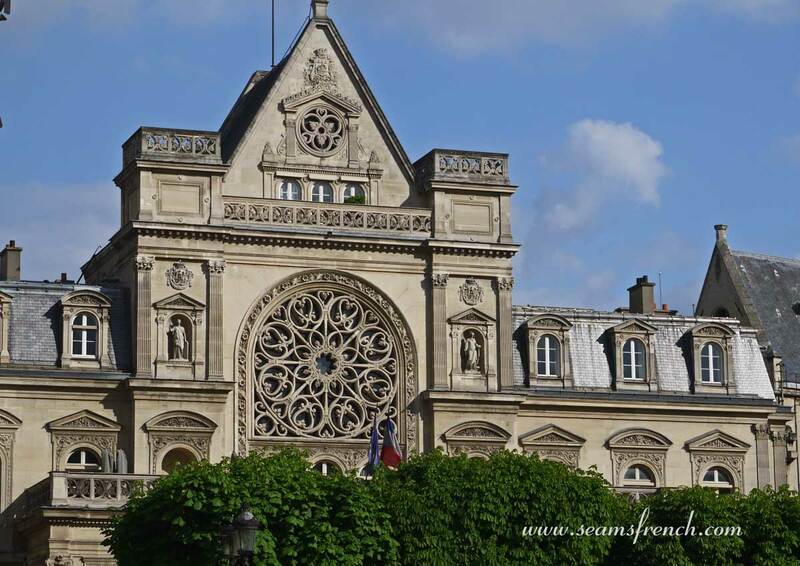 Below is a photo of a rose window taken in Paris a number of years ago. It was seeing this particular window for the first time that I had the idea it could easily be translated into a pattern of channels required for stitching boutis. 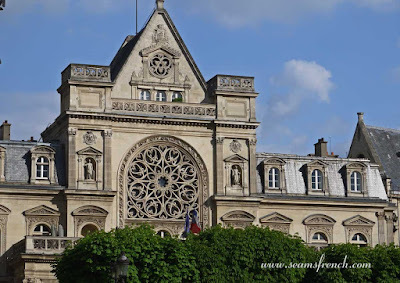 Ironically, this building is not even a cathedral, but rather it is Paris City Hall in the "premier arrondissement". Never mind that, the rose window is still beautiful. 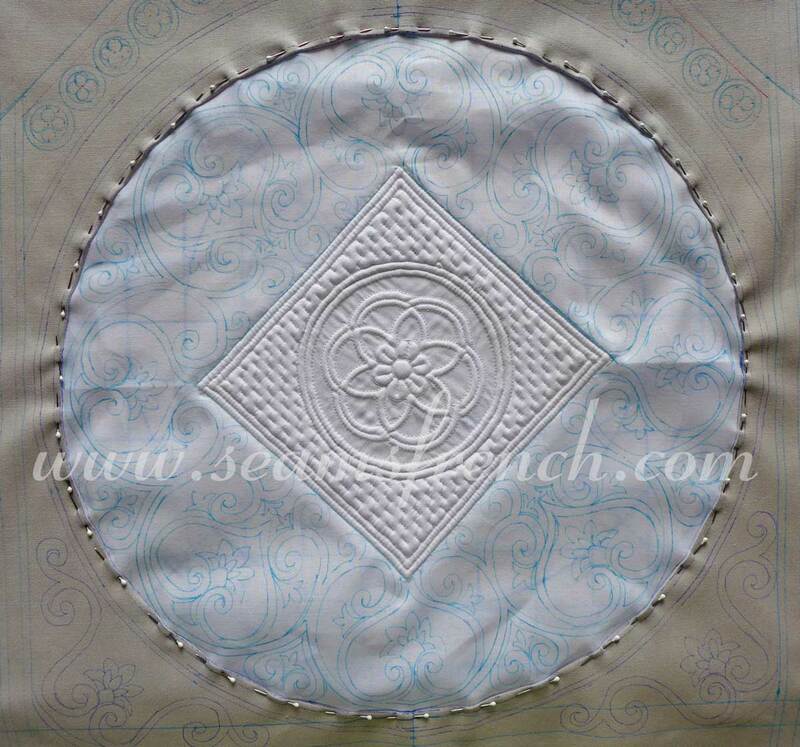 That rose window became the springboard for the original 5" x 5" boutis piece, as well as the quilting design that will frame the boutis. 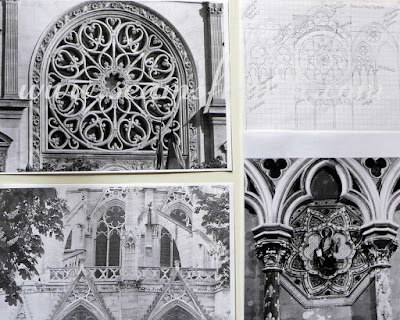 Included are 2 photos of actual cathedrals. Below is the final quilting design, (a loose interpretation of the original). 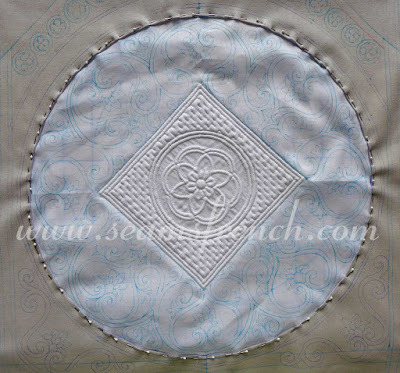 The blank square in the center of the circle is where the boutis will be reverse appliqued into place. The inner circles were drawn prematurely and should not be there. Below, the quilting pattern has been traced onto some white batiste, and the boutis square has been reverse appliqued into the center. The back of the boutis is trimmed to 1/4 inch. It will be sandwiched between the layers of batting and backing. 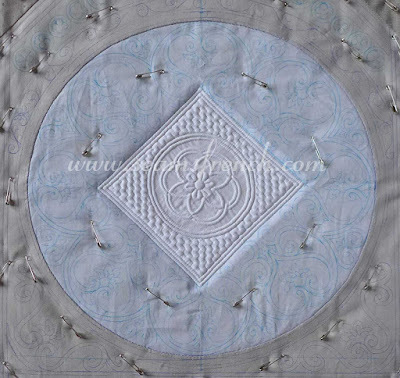 Next, the entire circular window is reverse appliqued into a gray fabric, which will form the stone tower for my rose window. Both the front and back of the boutis should be visible in the finished product. Therefore, batting and backing are aligned with the front and a 5 " square is cut out of both materials where the back of the boutis will remain visible. 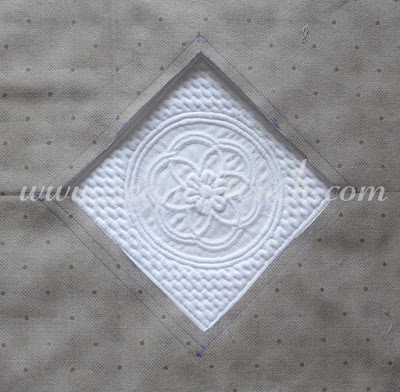 The backing fabric encloses the batting and is appliqued to the back side of the boutis. Whoa! This is ambitious and it's going to be gorgeous! 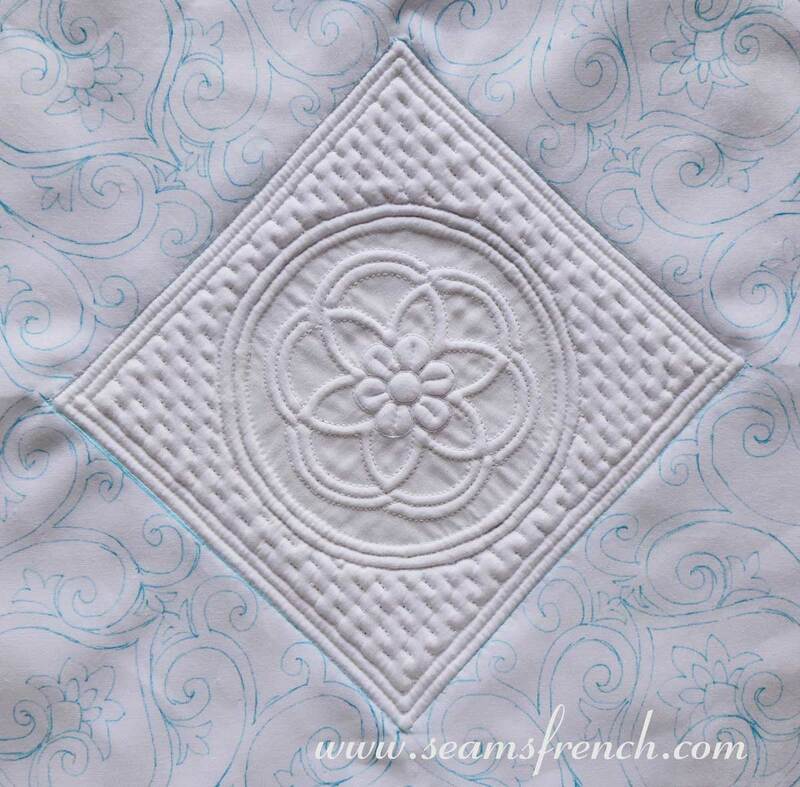 You are doing some really creative work combining boutis with FMQ. How big will the finished piece be? Thanks so much for your vote of confidence. Once I decided how to finish the piece, it was actually easier to design then some because the pics provided the pattern. The finished piece, point to base, is 31" x 16"; wall hanging size. Szczęśliwe grettings pikowania do Ciebie. Dzięki za zatrzymanie się. Thanks Grit. I appreciate your comments. So beautiful!! 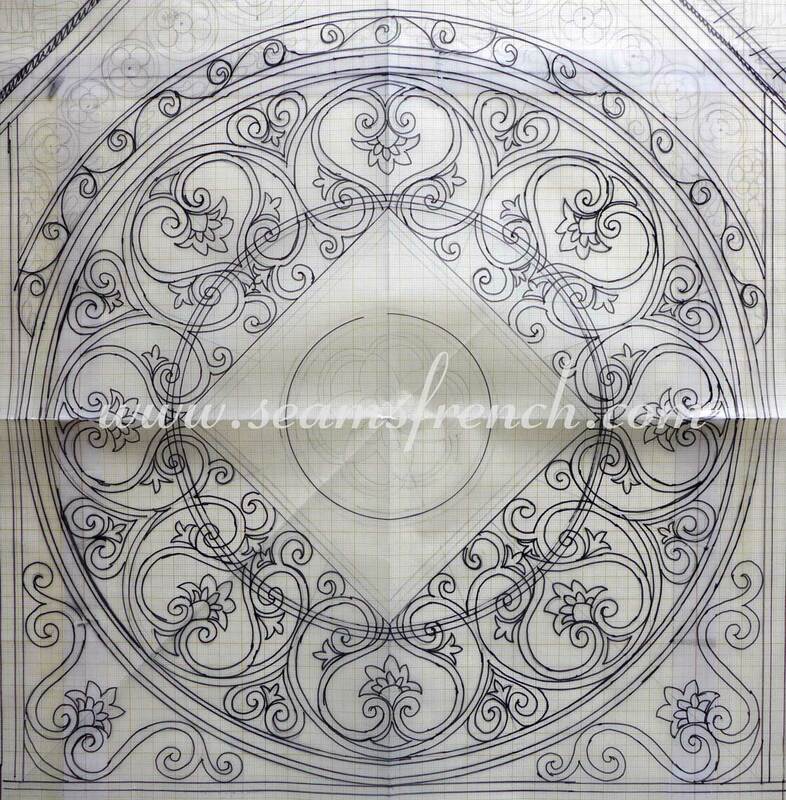 I love how you come up with a design from the rose window. If I do that my brain hurts. At a smocking guild meeting this week, one of the members said she has three different boutis books, and not one of them has any directions for finishing. 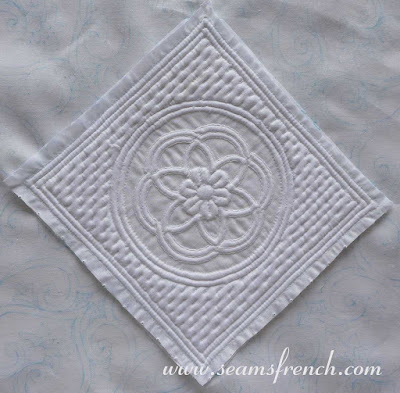 It's like the quilt instructions that give all the directions for piecing, then leaves it with "quilt as desired", which frustrates me no end. 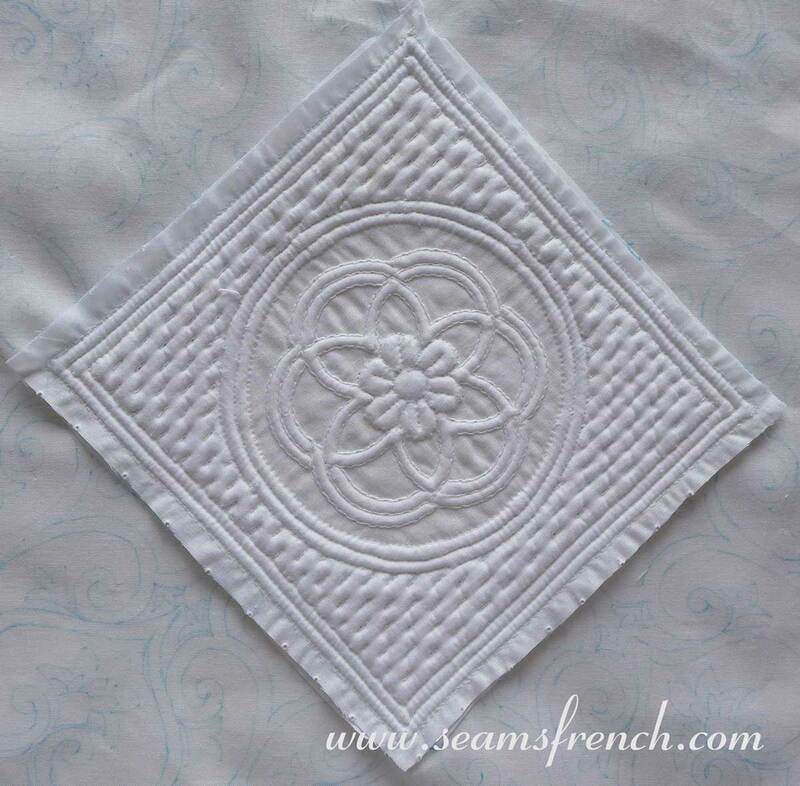 I can't wait to see your machine quilting, I'm so bad at it. Hi Cynthia. I know what you mean by the "quilt as desired" instructions. (It's like the "bake until done" recipes!). I can "qvetsch" something awful about how to finish a project, so in the end, I usually go for a technique that I enjoy and hopefully, the resulting item will be something useful as well.